The Olympus OM-D E-M10 Mark III brings advanced features down to temptingly low price point, proving that you don't need to shell out loads for a capable mirrorless camera. On top of its 16.1MP Micro Four Thirds sensor, highlights include 8.6fps burst shooting and a 121-point contrast-detect AF system, together with a five-axis image stabilisation system that promises to keep things steady when you're working in poor light or with longer focal lengths. This latter feature is great as it means you don't have to think about buying lenses with image stabilisation, as you might with some other systems. As you have it in the body at all times, you can just enjoy its benefits with an exhaustive range of optics. You also get 4K video recording – a feature that's only otherwise present on the much pricier flagship OM-D E-M1 Mark II in the Olympus OM-D line-up – as well as a 2.36million-dot OLED viewfinder and a touchscreen that can be tilted up and down to help you out when shooting from awkward angles. Built-in Wi-Fi also lets you grab your images from the camera with ease so that you can make adjustments on a smartphone or tablet, or just share them out to the wider world as they are. As with the other models in the OM-D stable, the camera is compatible with a broad range of Micro Four Thirds lenses, not just from Olympus but also Panasonic, Sigma, Samyang and others. This means that, in contrast to certain other newer mirrorless systems, it's not only more likely that the lens you want actually exists, but you may even have a choice of between the different brands. 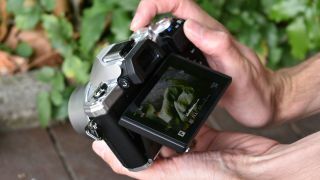 In our hands-on review of the model, we found the camera's autofocus system to be nice and snappy, and we appreciated the small ergonomic changes Olympus has made to the handgrip from the older Mark II model. Images also appear sharp and full of detail from our initial assessments. If you like what you see, scroll down to see the best deals on the Olympus OM-D E-M10 Mark III.